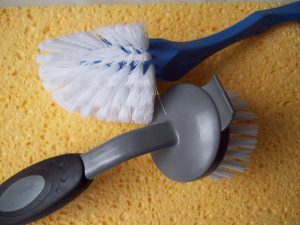 Sponges, brushes, and dish cloths can harbour bacteria, especially if kept damp. Try to dry them out after use and they can be kept clean by soaking in bleach solution. Also sponges can be heated in the microwave, brushes put in the dishwasher and cloths in the washing machine.You should clean up risky contamination like raw meat and poultry juices or egg using paper towel, which you can then discard, and wash hands afterwards.